I won’t deny Through the Ever Night was good read. I especially liked how the character, Soren, was intergraded into the plot. But I didn’t think this novel was the best of the series. At least so far. The biggest reason I wasn’t as connected with Through the Ever Night as I was with Under the Never Sky was because Aria and Perry were apart for the majority of the story. This didn’t feel right, and I definitely wasn’t captivated by new role Perry assumed as the new Tides Blood Lord. Don’t get me wrong, Perry is still the amazing guy I love from the first novel, and he was still very swoon worthy when he and Aria are actually together. But Perry’s battle of day to day survival in the village wasn’t as intriguing as the day to day survival Aria and Perry faced together in Under the Never Sky. Then there was Roar and Liv. Truth is, some of best, most exciting parts of the story were set in Rim – where Liv is being held. Even Sable, the Rim Blood Lord leader, was an awesome antagonist in Roar’s and Liv’s lives, but in the end, I wasn’t really captivated by their romance. I also didn’t really see how it tied into the story or what their main purpose was. In all, this is definitely a good read and definitely an amazing series. 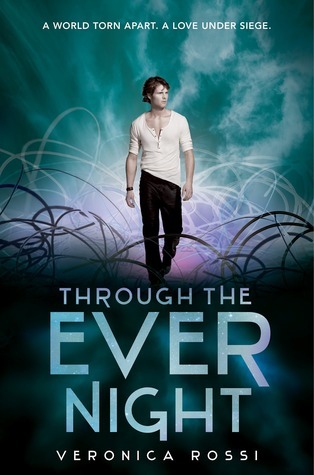 Based on the ending of Through the Ever Night, I can’t wait for Into the Still Blue (Under the Never Sky #3). Next postRandom Acts of Kindness Giveaway Hop! That is a bummer when the MC’s are apart for the majority of the story. I don’t mind brief separation/angst, but I enjoy watching the MC’s interact in a romance. “Blood Lord of the Tides” cracks me up. You can tell I’m not a big fantasy fan!